Photo taken by Monica Wise. It’s the gun against the prayer. This is no exaggeration. Just a few weeks ago near the Standing Rock protest encampment, the police shot people with rubber bullets as they tried to cross a wooden foot bridge to pray on a hill where Oceti Sakowin ancestors are buried. It was not the first time that a ceremony has been interrupted by militarized law enforcement. 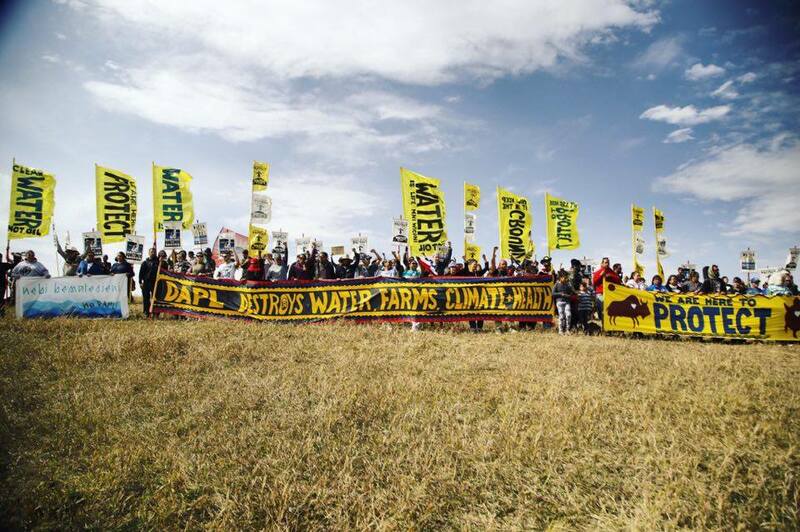 The water protectors (those at Standing Rock have made it clear that they are protectors, not protesters) have rooted their struggle against the Dakota Access Pipeline (DAPL) in ceremony, spirituality, in honoring the ancestors and praying for the water. The companies behind DAPL and police forces have rooted their response in legal jargon, militarization, and fear. It’s the gun against the prayer, oil against water, love against fear. It’s an old story for both sides. The pipeline and those who resist it are part of a centuries old history of colonization and survival. People of the Lakota and Dakota Nations, collectively called the Sioux, have lived along the Missouri River since the 1700s. The land through which DAPL cuts is ancestral Sioux land, which was never been legally ceded to the United States. The land was first “purchased” by the United States from France in the Louisiana Purchase. However, as Nick Estes explains, “none of the Native Nations west of the Mississippi consented to the sale of their lands to a sovereign they neither recognized nor viewed as superior.” This began a long process of U.S. government sponsored land theft and oppression of the Sioux people, often done under the guise of legal treaties and military actions (you can read a more complete history here). After gold was found in the west, what was considered a “permanent Indian frontier” with no economic value, became a source of mineral wealth to be extracted. The government signed dubious treaties (which were never truly ratified by the majority of the Sioux people) in 1851, 1868, and 1889, which significantly reduced tribal land first to 25 million acres, and eventually into five, much smaller reservations, including the current Standing Rock Reservation. The holy land of the Black Hills were found to have gold and were illegally annexed from the Sioux in 1876. Along with the treaties, direct violence and intimidation were used to decimate, humiliate, and assimilate the Dakota and Lakota people. In the early 1860s General Sully lead a campaign that massacred at least three hundred peaceful Yanktonai (a division of the Dakota people) people at Whitestone Hill, a prelude to the 300 Lakota people murdered by the 7th Cavalry Regiment at Wounded Knee in 1890. In 1883 the U.S. government enacted “Indian Offenses” that strictly forbade all traditional ceremonies, and the Sioux people began to reluctantly trade in tepees for log cabins, hunting for farming (all of the buffalo were over-hunted by white settlers), and began to send their kids to government schools. A series of legislative acts in the 1950s, including House Concurrent Resolution 108, Public Law 280 and the Indian Relocation Act of 1956, severely limited tribal sovereignty. This long history of colonial violence, legalized oppression, and land theft led Native Americans to organize anew in the 1960s and 70s. Activists formed the American Indian Movement (AIM), and the energy from this movement led to a national gathering at the Standing Rock reservation in 1974, which created the International Indian Treaty Council. AIM, like many other movements led by people of color in the 1970s, was subjected to government repression (a prelude to what we are seeing today). This is a very short synopsis of the long, hard history that is the backdrop to where the Standing Rock water protectors are today. The Dakota Access Pipeline is 1,172 miles long and goes right through ancestral Sioux land and the Missouri River, carrying 470,000 barrels of fracked oil a day from the Bakken oil fields. But this hunk of metal carries more than just oil. It carries forward the legacy of colonization on many levels. Construction rips through Sioux burial grounds and other sacred sites, some of which have already been destroyed. Pipelines spill very frequently, and so the DAPL carries with it the obvious risk of contaminated water, which would disproportionately affect Native people on the reservation (in fact, the pipeline was originally slated to go through the Missouri River near Bismarck, ND, which is 92% white, until it was rejected for fears of contaminating their water). But even if the pipeline never breaks, it carries a dangerous intensification of fossil fuel extraction and the burning of carbon. The negative effects of the fossil fuel economy are unevenly meted out, as they always have been. Today, indigenous communities face the worst effects of climate change, much like they faced the worst effects of white settlers over-hunting the buffalo, cutting down the forests, and damming the rivers. Those who still live symbiotically with the land are the most affected by it’s degradation, and are the first to see it hurting. This explains why Indigenous people from South America to Norway to New Zealand have traveled to Standing Rock to show their solidarity. But it’s not just the pain that they see, it’s also the healing path forward. Robin Wall Kimmerer, biologist and member of the Citizen Potawatomi Nation, writes about the two sides of the barriers at Standing Rock: “On one side is the unquestioned assumption that land is merely a warehouse of lifeless materials that have been given to (some of) us by God or conquest, to use without constraint…on the other side of the concrete barriers is a story that is so ancient it seems revolutionary.” This ancient story is one of a world in symbiosis, where all things are connected, both spiritually and physically, where water does not just sustain life, but is life itself. This is the story that inspires and leads the water protectors. They had Native Americans out there praying for the land. They put a tipi up in front of the actual pipeline route, and they called that a riot. Right after the Louisiana Purchase, Thomas Jefferson sent Lewis and Clark into the wild west to explore the new part of the nation. They went right through Sioux territory, and Clark wrote in his journal that they were the “vilest miscreants of the savage race.” He was deeply upset because the Sioux were not as hospitable to the aggressive advances of white explorers and trappers as he would have liked. From this early journey into modern times, resistance to people and projects that threaten native sovereignty has been seen by the government and profit-seekers as a crime. In recent confrontations between the police (and private security) and water protectors at Standing Rock, we can see how concepts of criminality and ‘violence’ are used against those who are just trying to protect their ancestral lands. For Instance, a representative of the Morton County Sheriff’s Department recently described how a “crowd of protesters, estimated to be a few hundred people, became violent. They stampeded into the construction area with horses, dogs and vehicles.” Somehow, just stepping onto land, which was never ceded to the U.S. government to begin with, is now considered an act of violence by the very forces that dress in riot gear, deploy LRAD sound cannons, shoot rubber bullets, and arrest peaceful people in droves. Why do they fear Native American people occupying their own land? The architects of DAPL fear this assertion of Native sovereignty, the rejection of the growth-at-all-costs economy, perhaps because they know that when Native people have autonomy on their own land, they can teach us all how to live in another paradigm that doesn’t rely on their dirty oil. We can begin to relate to the land differently, wherever we are. We can learn about native seeds, local ecologies, the ways in which climate change will affect local fauna and flora. We can create a spiritual connection with our home-place, and take that connection into our own fights against dangerous infrastructure projects. We can apply these lessons everywhere. 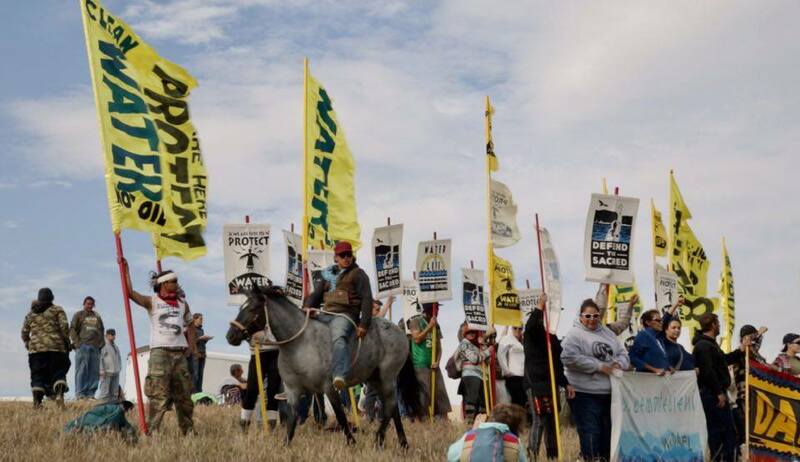 The architects of DAPL, like bankers and mainstream politicians across the world, would like us to believe that there is no alternative to capitalism. Some, including our president-elect, deny climate change is even a problem, and those who do admit to it talk about accords, reductions, credits and a million other half-measures that simply won’t cut it. These ‘important’ people will, like Kelcy Warren in the quote above, excuse the continued destruction of the land with the refrain: it’s been this way for a long time. But it hasn’t. It has been this way for a very short time, in certain industrialized countries. And in that short time we have nearly pushed our planet beyond the tipping point. For much longer, we should remember, human communities operated on a different paradigm. For millennia, people didn’t see nature as something to be conquered, measured, labeled and sold. They saw it, all of it, as home for themselves and countless other sacred plants and animals. For most of history, humans lived in deep symbiosis with their environment. The era of big dams, big mines, big pipelines, and big money is a new, unprecedented experiment, and it has failed us miserably. The Dakota Access Pipeline isn’t inevitable. A new world, however, is. And we get to choose, daily, what that new world will look like. Share with friends the book by Robin Wall Kimmerer, Braiding Sweetgrass. It opens mind and body to the world we were created for, the natural world. We seem to be OK with destroying our own world because we all have been put on reservations defined by concrete and buildings and boundaries, so that we are compelled to live separated from the natural world. She reveals an enriched reality, a truth that resonates so clearly and with such humanity that you can see yourself standing not outside the Garden of Eden, but in it. And she does this by shining a light on native ways and science both, for she is a scientist also, and those ways can show us how to live in profound gratitude, not for what we don’t have, or think we need to sell to China or elsewhere, but the richness of what we do have, still. But which urgently needs our recognition and protection. That’s our purpose. Without an ability to draw strength from this view of our purpose, this time of growing meanness will only lead to despair for everyone, even the people who are being used to repress the rest. And despair we must not. Not now!